Diane is one of Britain’s most successful 800m runners. She won a Gold Medal in the 1990 Commonwealth Games, and followed this up with a further Silver and Bronze Medal. She has also competed in 4 Olympic Games, 1988 in Seoul, 1992 in Barcelona, 1996 in Atlanta and 2000 in Sydney. Diane is both the former British and Commonwealth Record Holder. Her determination, perseverance and strength were well documented on the track but she had to muster all her reserves off the track to deal with being falsely accused of taking performance-enhancing drugs. It was a battle that tore her whole life apart, but one that she finally won and after being proved innocent in 1996. Such was her determination she went on to win another medal in the Commonwealth Games in 1998 and returned to her position as one of Britain’s best ever 800m runners. 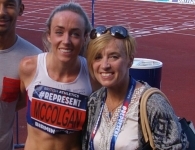 Since retiring from athletics she has dedicated herself to a number of great causes, currently Lay Adviser to the Central Manchester Clinical Commissioning Group and was previously the Chief Ambassador for the National Charity – Street Games. In 2010 Diane established the Diane Modahl Sports Foundation (DMSF) a registered charity. It champions undiscovered talent and brings high quality athletics coaching and mentoring opportunities to both able-bodied and disabled young people, particularly those living in some of the poorest areas across the UK. Diane is an inspiration to all that meet her, and in her presentations she talks passionately about what it takes to get to the very top of your career, whilst reflecting on some of the barriers that were put in her way and how she bounced back from them. Diane is also an author, having published The Diane Modahl Story in 1995, a BBC TV presenter, an Honorary Doctorate from Manchester Metropolitan University, University of Salford, UMIST and University of Manchester. Some people may recognise her from her appearance on ITV’s “I’m A Celebrity – Get Me Out Of Here! 11 years old and running up and down the fields at the back of our house in Longsight Manchester, race after race against the other kids in our neighbourhood. My dad was a great coach! He would organise us all and back then we didn’t race for medals it was chocolate and ice-cream. It worked! Mirus Yifter from Ethiopia. The amazing long distance runner who acquired the nickname Yifter the Shifter. I think you can work out why…..he was quick, a devastating finish in the last 200m. was renowned as an England and GB 800m runner and won Gold Medal in the 1990 Commonwealth Games, where I broke the Commonwealth Games record. Also won Silver (’86)and Bronze Medal (’98). I competed in four Olympic Games, 1988 in Seoul, 1992 in Barcelona, 1996 in Atlanta and 2000 in Sydney and am the former British and Commonwealth Record Holder. Since retiring from athletics I have dedicated myself to a number of great causes, currently Lay Adviser to the Central Manchester Clinical Commissioning Group and was previously the Chief Ambassador for the National Charity – Street Games. In 2010 I established the Diane Modahl Sports Foundation (DMSF) a registered charity. We work with some of the North West’s most disadvantaged young people, providing an opportunity for them to aspire to, and fulfill their potential in sport, at school and in life. We champion undiscovered talent and bring high quality sports coaching and mentoring opportunities to both able-bodied and disabled young people. I am also an author, having published The Diane Modahl Story in 1995, a BBC TV presenter, an Honorary Doctorate from Manchester Metropolitan University, University of Salford, UMIST and University of Manchester. Did you feel becoming a coach was a natural transition for you after being an athlete? I always vowed that I’d NEVER become a coach. Look where that got me! Do you coach mixed gender? Do you find you have to adapt your coaching style to coach girls/ women or boys / men? Yes we coach both boys and girls and have a team of inspirational men AND women to coach them. It’s imperative that our young people learn a diverse set of skills from people of both genders and from different backgrounds. Every time I turn up at a track or a school and see young people involved in the DMSF programme excitedly waiting to start training or have already started leading the session amongst themselves. I feel humbled by that sight every time. That the DMSF inspires, motivates and nurtures the next generation. I want to ensure that our programme motivates young people to raise their aspirations, set SMART goals and strive to achieve them. We are also working hard towards the 2014 City of Champions Dinner; a prestigious gala dinner event now in its second year. In 2013 it honoured the career of special guest Sir Chris Hoy and this year will be celebrating the career and achievements of other business, cultural and sporting icons. There could certainly be more female leaders. We need to value all our coaches, either male or female. Most of the time this can mean reimbursing them for the countless hours they commit to coaching. It can also mean providing opportunities for them to gain extra skills within governance, strategy and executive leadership.